With hosted VOIP, running a hosted call centre couldn’t be easier. With full control over your telephone system, you can ensure calls are being dealt with quickly and efficiently and that customers are receiving the best possible service from your company. Our amazing VOIP telephone system features ensure that your hosted call centre runs smoothly. With a hosted call centre system provided by VOIPE you can access your call logs any time, anywhere. Meaning no matter where you are you can always check on how many calls your staff receive each day and which staff are answering the most calls. Our phone systems allow you to check on which of your staff are available to take calls, across all of your sites so efficient staffing can be maintained and customers are not left waiting on hold. VOIP phone systems also allow for call recording, so you can record calls for training purposes or can be used to help with conflict resolution. Your business is no longer restricted by geographical location. You can hire staff from anywhere in the world and they can work remotely using our softphone app. The calls go through your business telephone number, so customers cannot see that the call is being taken on another device. This also means that your business’ growth is not restricted by location! Monitor in real-time which staff are on calls, how long they have been on the phone and how many customers are in a queue. This allows you to stay on top of staff productivity and resolve any issues with bottlenecks or availability quickly so you don’t lose business. When taking on staff in different locations, this is a useful feature to keep track of staff no matter where they may be. 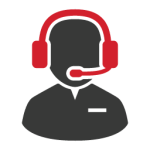 With the contact centre phone system software you can mix on premise and virtual staff seamlessly to lessen the time customers are queueing, therefore increasing customer satisfaction! You can easily add and remove workers from your dashboard with no hassle or additional cost, so your phone system can grow with your business. Take a look at our hosted VOIP pricing to discover how cost effective running your hosted call centre with VOIPE can be!